Today marks the official beginning of Lent, where we meditate on the sacrificial love of Christ, as well as take up other sacrifices for this liturgical season. And what better day to celebrate our Divine Bridegroom than on Valentine’s Day? So! For today, I would like to turn your attention to this lovely painting by Botticelli! Temptations of Christ, by Sandro Botticelli, c. 1481-82. Sistine Chapel, Vatican City, Rome, Italy. This painting is called the Temptations of Christ, and indeed the three temptations are featured in the painting! In the upper left, Satan, disguised as a hermit, shows Jesus some stones and tempts Jesus, who has been fasting for forty days, to turn the stones into bread. At the very top, Satan tempts Jesus to fling Himself off the Temple and use His power to save Himself. Finally, for the last temptation, Satan takes Him to the top of the mountain and tempts Jesus with the world… which Satan is more than happy to give to Him in exchange for Christ to submit to the devil as ruler of all. At which point, Jesus tells Satan to get lost. But, the interesting thing about this picture is that the temptations that Christ goes through is not actually the main focus of the painting. Indeed, the temptations are in the background. Instead, the focus of the painting centers on a man giving a sacrificial offering to a priest, who proceeds to burn up the offering, while everybody gazes in wonder at this exchange. So, what this going on in this picture? Good question! Remember that leper whom Jesus heals and tells to go to the Temple to make the appropriate sacrifice that Moses instructed Israel to do? That’s him! He is now clean and makes his sacrifice while everybody watches, astonished. An interesting juxtaposition, to be sure! The painting, which is entitled The Temptations of Christ, puts the actual temptations in the background, whereas the simple sacrifice of a leper who was simply following the Law is displayed front and center! Now, I don’t know about you, but sometimes I will have conversations with others about Lenten sacrifices, and the response will be confusion. Why give up sweets? In fact, why give up anything? Why not add something special in our lives that give us meaning instead of giving up something? After all, giving up things — especially nice things which are enjoyable and good and not sinful — is hard, and in the grand scheme of things, improving yourself would be better than a temporary sacrifice. To that, I would respond: it is good to improve ourselves, and we should strive to be perfect, just like our heavenly father is perfect. But, sometimes it’s the little sacrifices that we can make out of pure love that are even more important than all the grand things we can do. I am especially reminded of that this Valentine’s Day… usually, my husband will make some grand display. Today? He is sick. Which means that he is right now asleep and I am doing my best to manage the household while not over-exerting myself, since I am still recovering from surgery. But, handling things on my own reminds me of the huge strength and little sacrifices that he makes for me on any given day that I can sometimes take for granted. And the little things he can do — like making peanut butter and jelly sandwiches for our toddlers while I soothe a fussy baby — I appreciate that much more. And perhaps it is that way with God. After all, there is nothing we can do to earn our salvation… we are not and will never be greater than God. We must rely on Christ, our Bridegroom for salvation. When you first saw this painting, what did you think it was about? 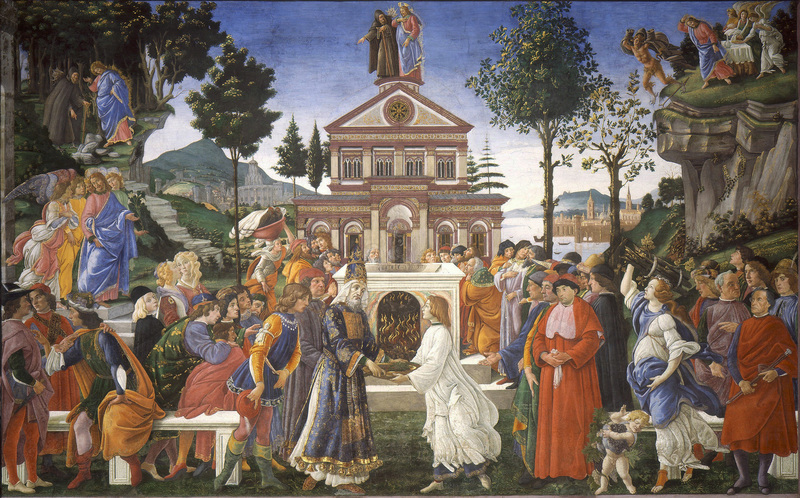 Why do you think Botticelli chose to put the leper’s sacrifice front and center? During the temptations that Christ experienced, He was alone. Yet, in the sacrifice, everyone is brought together. Why do you think that is? Help us to do little things with great love. ← Fat Tuesday Life Updates!